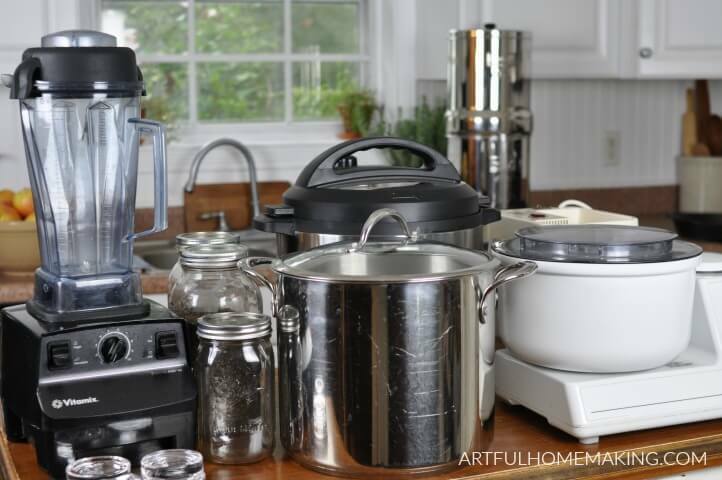 9 must-have real food kitchen tools to help you cook healthy food from scratch! I’ve had an interest in real food cooking ever since my teen years. It all started with a book about whole foods that my dad gave me. That, and the weekly trips to the health food store with my mom. One of the first skills I acquired was learning how to make my own bone broth (which I now make in the Instant Pot). From there, I moved on to grinding my own grain, making whole grain bread, fermenting food, and other from scratch cooking. Cooking from scratch and making nourishing, traditional food requires some special tools. Today I wanted to share my 9 must-have real food kitchen tools. Some of these tools are newer additions to our kitchen, and others have been around for almost 20 years. Here are my favorite kitchen tools. 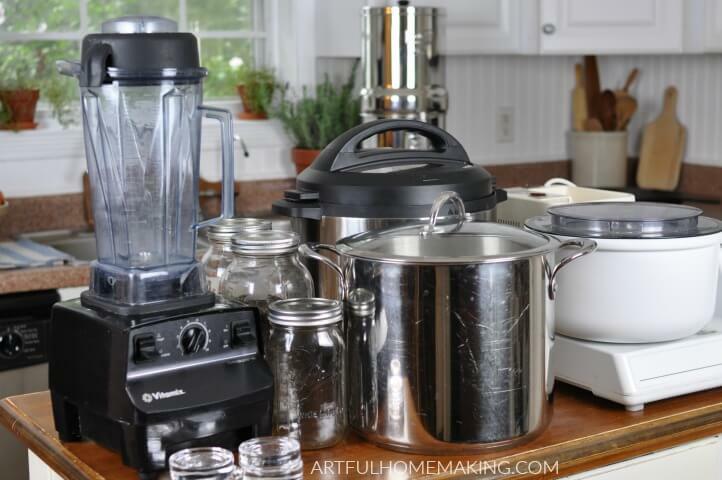 One of my main must-have tools would be our Berkey Water Filter. We’ve been using a Berkey for over 10 years (maybe closer to 15, I can’t remember). To me, having clean and safe water to drink makes this a non-negotiable item in our kitchen. With seven people in our home, our Berkey sees a ton of use! We have the Royal Berkey size, which works well for our family of seven. We bought our Vitamix around 7 or 8 years ago during a time when my husband was dealing with some health issues. In an effort to heal his gut, we bought the Vitamix, and it’s been seeing daily use ever since! Our whole family uses the blender to make smoothies and other healthy concoctions, so it often is used daily, if not several times a day. It’s one of the best purchases we’ve ever made. Out of all the kitchen tools mentioned in this post, our grain mill has been with us the longest. We bought it when I was pregnant with my second oldest daughter, and she’ll be 18 soon! Early in our marriage, I had read that grains lose many nutrients and become rancid shortly after being ground into flour. Therefore, to preserve the freshness and potency of the grains, a grain mill was necessary. We didn’t have a lot of money in those days, so my husband looked around and found a used grain mill for about $70. It was owned by a family who ran a mail-order health business, and it had been gently used. We buy wheat berries and other grains from our food co-op (currently Azure Standard) and grind our own flour whenever we need it. This is the grain mill we have, and it has served us well for almost 20 years (although our older model was manufactured by K-Tec and now the company is called Blendtec, so I’m not sure how the two compare). We’ve had our Bosch Universal mixer for 16 years, and it’s still going strong! It’s made so many loaves of whole grain homemade bread through the years! I love that I can make 6 loaves of this recipe at a time with this mixer to knead all that dough. Since my mixer is close to 20 years old, it looks slightly different than the updated design of the Bosch Universal here, but it’s the same one. Years ago we switched out all our non-stick pots and pans with stainless steel ones. We bought a basic set of high-quality stainless steel cookware (similar to this one), and they are in use on a daily basis. My favorite piece of stainless steel cookware is my 12-quart stock pot. I love it and use it often for making homemade, nourishing soups and stews. Our cast iron skillet is another item that’s been with us for many years, and it will probably be here forever. I just love the durability of cast iron. I’ve only had my Instant Pot for a few years, but it has quickly become one of my favorite real food kitchen tools. With this one piece of equipment I can make boiled eggs, bone broth, a whole chicken, apple butter, elderberry syrup, and so much more! We have this one. I use Mason jars for everything! My mom gave me several boxes of the half-gallon size and I love using them to organize the pantry. In addition to organizing, I also use Mason jars to store bone broth in the freezer, for fermenting, and so many other things. We even use the smaller 8 ounce jars as drinking glasses! These are definitely essential in my kitchen. When I first started making sauerkraut, I didn’t even use any weights. I just followed the instructions in the Nourishing Traditions cookbook. And it worked fine. But since then I’ve discovered a few fermenting accessories that make the whole process simpler. 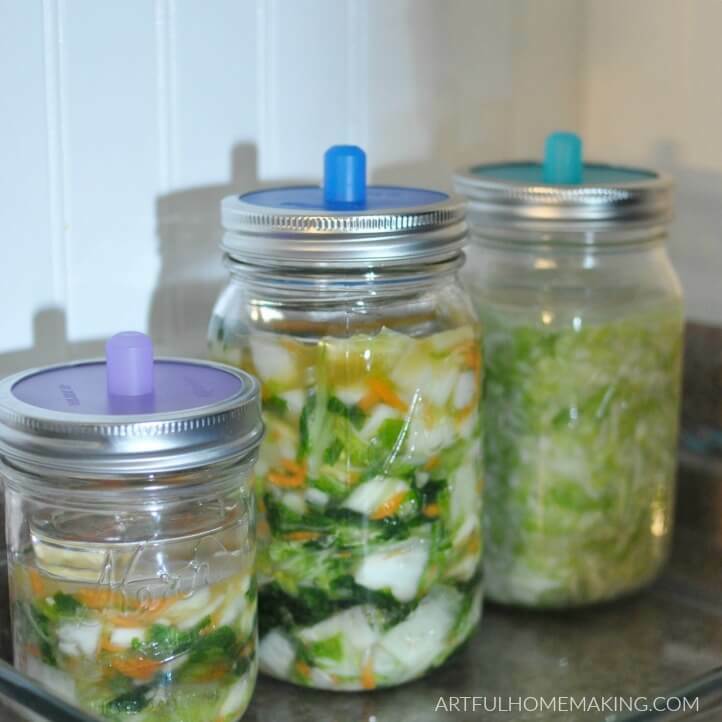 I love these fermenting weights and these airlock lids for making all sorts of fermented foods. I didn’t list these above, but I still love having access to them in my kitchen! Ice Cream Maker: We’ve had this Cuisinart ice cream maker for almost 8 years now, and it makes homemade healthy ice cream so much easier! Food Processor: My mother-in-law blessed me with the food processor we have. It was one she had in her kitchen and decided she didn’t need it anymore. I’d love to hear what your list of must-have real food kitchen tools would include! You have quite the arsenal here. I do love my canning jars, and I also use them for everything! Canning jars are the best and most versatile! Vitamix, InstaPot and mason jars are staples at my house. Love them! They’re so useful to have around! Awesome that you live off the grid! We love our Berkey water filter too. A dear friend gave it to us 7 or so years ago and it has seen daily use since. One of the things I love best about it (other than great tasting water), is because it holds so much, you don’t have to constantly refill it like the smaller filtered pitchers. We used those for several years before we go the Berkey and boy, was it a pain to always be filling it everytime you wanted a drink. Thank you, Katie! How nice that your friend gave you a Berkey! I agree, it’s so convenient to not have to be constantly refilling it.